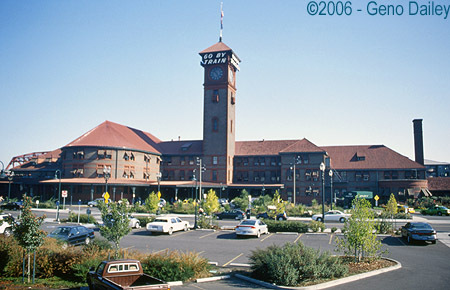 Portland Union Station shortly after arriving on the Empire Builder. 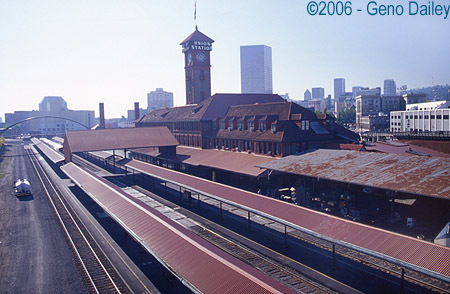 An overhead view of the station from Broadway Bridge. Another wide-angle view of the station. 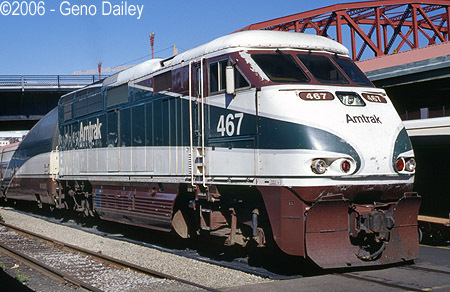 Amtrak's Empire Builder - Train #27 having recently arrived in Portland. F59PHI #470 on one end of Cascades Train #506 seen at 11:59am. NPCU (Former F40PHR #340) #90340 is on the rear end of Cascades Train #506.
on the rear-end as these trains operate in push-pull mode. F59PHI #467 on the lead of Train #516, seen at 12:05pm. 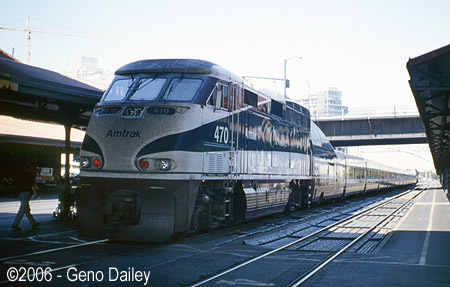 Having recently arrived at Union Station is Amtrak's Coast Starlight. no one ever said the railroad is supposed to look pretty! Back at the station, I picked up a package of Junior Mints in the station gift shop which features railroad t-shirts and hats for sale along with snacks and beverages. I then was given permission to photograph the 2 Cascades Trains that were parked at the station. Those Cascades Trains look really neat, I have to come back here again sometime and take a ride on one! 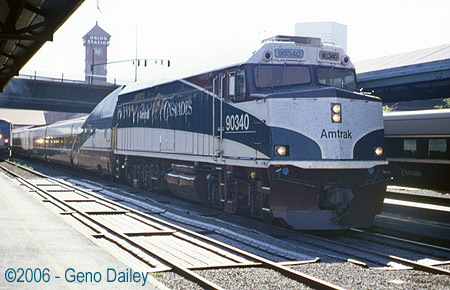 Cascades Service is partially state-funded and operates 1 train as far North as Vancouver, British Columbia, Canada with most service between Seattle, WA and Eugene, OR. These are “Talgo” trains and have only one wheel at each end of the cars and are operated in “Push-Pull” fashion with an F59PHI on one end and a “Cabbage” F40PH (Non-Powered Control Unit) on the other. 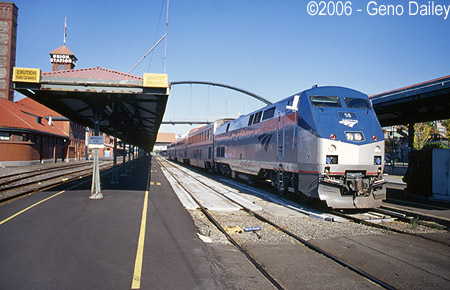 After taking the tour of the train and having a nice conversation with the ticket agent about Amtrak, I sat outside the station, made a phone call then went back in and picked up my luggage. 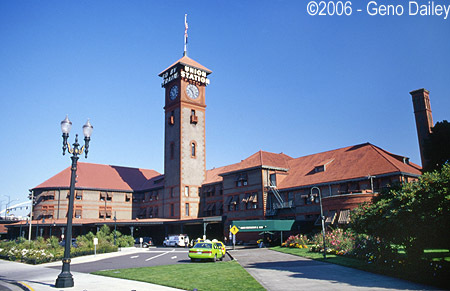 The monitor in the station said Train #11 – The Coast Starlight was due in Portland at 2:00pm and set for an on-time departure at 2:25pm. I chatted with a few passengers, one from Australia who had probably the largest backpack I’ve ever seen in my life on him! He said it weighed about 25lbs, he can have it! My backpack with my laptop is heavy enough especially when you’re lugging around 2 suitcases, a camera bag and a tripod! An announcement was made that Train #11 will arrive soon and we should board at Gate #7. First Class Passengers would board from their own entrance from the Metropolitan Lounge in the station. 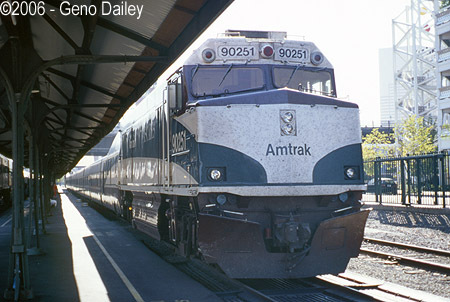 Our Conductor took my ticket and gave me a seat check just about when Train #11 arrived in Portland at about 1:55pm. I was given a seat in the “1113 Car” which was the last coach in the train. I dragged my luggage down platform and was told to take seat 17 in that coach by the Coach Attendant. I walked upstairs, found Seat #17 which I was pleasantly surprised to see that not only was it a window seat but every seat in this coach had AC outlets!!! This is a first for me on a Superliner! After putting my bags in the overhead compartment, we still had 19 minutes before scheduled departure so I made the walk down platform to the front of the train to get a picture before walking back to the train in time to board. I talked to another railfan who was a passenger in another coach who was also taking pictures as well. 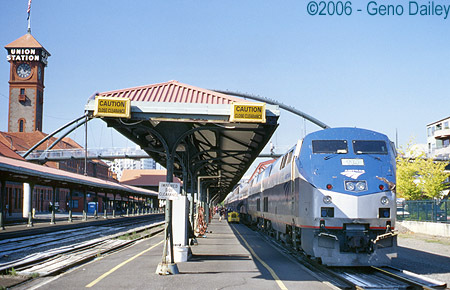 To check out my ride on the Coast Starlight to Los Angeles, please click below!! !